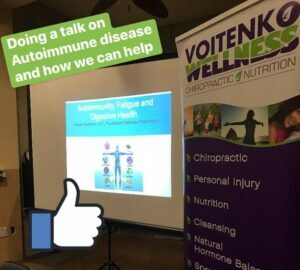 Every month Voitenko Wellness offers workshops to educate our patients and their friends and family to assist you in living a healthy lifestyle. Each month workshops are listed under the WORKSHOP tab above and this will give you details about the workshops we are offering. Mouse over the WORKSHOPS tab above to see the Workshop Offerings and click on the workshop title for more info. Take advantage of this FREE education and sign up to attend one of our workshops today! Don’t see the workshop you are looking for? We can come to you! If you have a group of at least five people, we can come do a presentation. Call our office at (714) 730-2225 or email our Community Outreach team at outreach@voitenkowellness.com to inquire. The only thing we ask is that you be 18 years old and have a health problem that concerns you. (714) 730-2225 or contact us HERE with any questions you may have.